An emotive Zimbabwean musician who is fluent on many instruments. Tichawona has a passion for the traditional Zimbabwe instrument , the Mbira. His performances are warm and exciting. With story and song you will travel on a journey through Africa’s musical landscapes. Culture, traditions and contemporized. Music to lift your spirit and warm your heart. 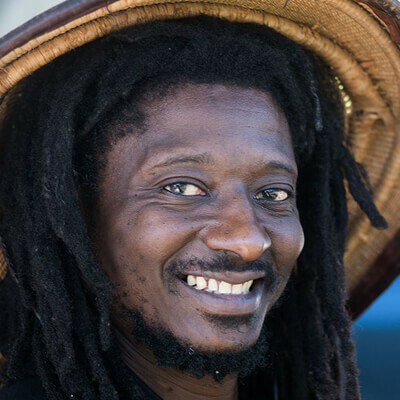 Tribal voices workshop is a cultural experience in song dance movement, mbira and shakers . Tichawona teaches the Nyunga Nyunga mbira and tribal singing. Tichawona will have the audience singing along and moving to basic African dance movements. “Story telling and cultural teaching about music. Workshop in Mbiraz and hosho or hand shakers. Cajon and African percussion. The songs are written in tablature on a board. By the end of a workshop participants can sing and play 4 songs well.